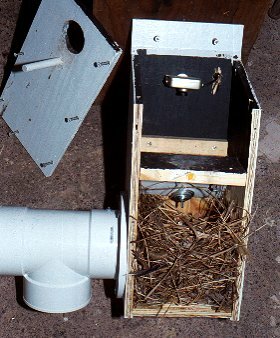 Video cameras were installed inside a series of nest box trap prototypes, beginning with a simple baffle trap with no moving parts which proved a very interesting failure and culminating in a quite promising tipping floor/sweeping wall trap. The interior cameras were a great aid in showing how the starlings reacted to each new challenge. After 6 days of watching the videos and making many modifications, a new trap evolved that seems to not have the drawbacks of the tipping can traps. It is a smaller, lighter, and simpler design and has, so far, retained 100 percent of the starlings that have entered it. 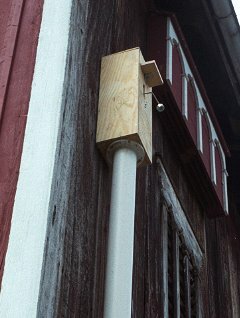 A nest box was fitted with a wood shelf directly under the entrance, which would block the view of the entrance of a bird that had entered and landed on the floor. An exit hole leading to a pvc T with 4" window was mounted on the side of the box near the floor. The idea was to encourage a visiting starling to exit through this hole. The trap was mounted on a shed and a starling was caught the first morning. Excited about this simple trap with no moving parts actually working, I built three more identical traps that night and mounted one in a better location on the barn wall the next morning. A video camera with infrared lighting was mounted under the roof of the trap and video was recorded continuously. A starling soon entered the trap, perched on the baffle for a moment, examining the floor below, and then dropped down to the bottom of the box. It turned in a circle several times, examining the box interior, but, paid no attention to the exit. Then it glanced up and immediately hopped up to the baffle and exited through the entrance. It soon returned with several blades of grass, followed by its mate. They began making repeated trips to the trap, rapidly building a nest, all the time paying no attention to the exit hole. It was now obvious that they viewed the bright light coming in the exit hole as simply a hole in the wall of their nesting cavity that would soon be blocked by the nest. Natural cavities often have such holes and the starlings quickly seal them off, leaving only the top entrance. So the simple baffle trap wouldn't do. Next I took down the trap and devised a movable flap hinged on the edge of the baffle, counterweighted to hang down, and linked to a pivoting pan on the floor which would cause the flap to partially close when a starling landed on the floor. I replaced the trap on the barn wall and the starlings immediately began to continue their nest building. The first starling to enter was surprised when the flap closed above him, but, in seconds, inserted his beak in the 1/2" crack and forced the flap open while scrambling up to the top of the baffle. This happened so quickly that individual video frames didn't catch much of the motion. The flap had closed just as intended, but this didn't pose much of a problem for the starling. Amazingly, the two starlings continued building their nest. Each time one would drop down to the floor, the flap would close and each time they wanted to leave, they simply inserted their beak in the narrow opening and forced the flap aside. They were using a nest box with a door and seemed to not mind at all. This trap caught a total of 5 starlings in several weeks. No nest was built inside. A pair of starlings had no problem thwarting this design and building a nest, even using the mechanical door. 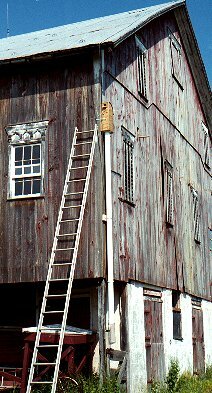 The above trap was replaced with a new design in which the counterweighted pivoting floor and wall would drop down when a starling landed on it and quickly flip back up, blocking escape. The starlings were simply much too fast for this mechanism. It caught a few, but many escaped. Again, their response was so rapid that single video frames missed much of the action. They were climbing over the sweeping wall before it traveled far enough to prevent this. The reaction time of these birds is just phenomenal. Shaping the roof of the trap into a curve to match the arc of the sweeping wall prevented the starling from climbing over the wall on its way down. This has resulted in a 100 percent catch rate. The tilting wall and floor are made from one piece of 28g galvanized steel with a hole cut in the wall to expose the trap's entrance hole. The adjustable counterweight extends through the front of the box, pivoting in a slot in the box just under the perch. As with all the traps in use this year, an artificial egg was affixed to the floor. 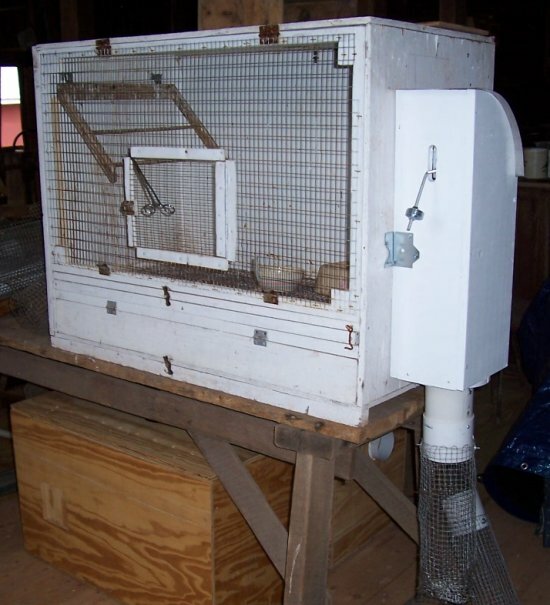 tipping floor and sweeping wall trap model D The first trial - mounted 8' high on a swallow shelter. A video camera was mounted just above the temporary cage, pointing upward. With this curved roof design, the starling was pushed down by the pivoting wall in every case. This last version reverts to the side entrance used earlier (spring 2004), but with the addition of a hole cover attached to the pivoting wall. 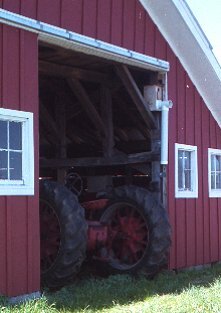 This shaves a fraction of a second off the time that the entrance hole is covered as the floor begins to pivot downward. The trap now has a slimmer profile and the curved roof doesn't offer a ledge for Robins to build a nest. The counterweight is now located on the side of the trap, away from the entrance. Starlings held in an aviary have not been able to escape this trap even when the downpipe is removed and the starlings contained in the bottom of the trap, within reach of the pivoting floor. Surprisingly, these starlings repeatedly entered the trap after they were released back into the aviary. I had always assumed that a starling, once caught and released, would not reenter a trap. Early data suggests the trap will work well with house sparrows. 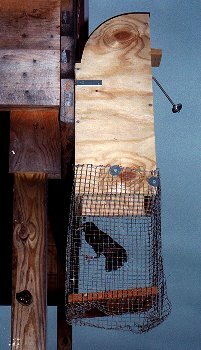 This week, Jan 26, 2005, this trap was tested with captive house sparrows in the aviary. One male entered the trap five times and tripped the mechanism within 1-5 seconds. On the sixth entry, he was able to avoid being caught for over a minute, presumably by remaining near the hinged end of the pivoting floor. So far, all starlings have been immediately caught, no matter how many times they have passed through the trap. Feb 4, 2005 update Several minor, but important modifications have now made the trap much more sensitive. A slightly different angle bend in the counterweight rod and a pin to limit the travel of the pivoting floor now allow a lighter counterweight. I owe the inspiration for these improvements to a male house sparrow who has spent the last few days in the aviary, frequently entering the adjacent trap as each new modification was tested. June 28, 2005 update For 3 weeks in March, a third male house sparrow enjoyed the hospitality of the trap testing aviary. This time, it took 17 trips through the trap over the course of several days, before he learned to avoid being instantly trapped. Even then, he would manage to remain in the trap for only a short time before dropping to the holding cage. Starlings from each days catch in the 4 wall mounted traps were usually placed in the aviary for a few hours to see if one of them could "beat" the trap. None did. Most were willing to repeatedly enter the trap, even though that meant being fished out of the holding cage and returned to the aviary each time. 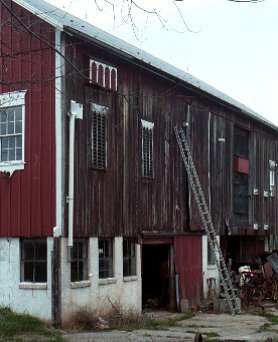 &COPY; 2004 - 2010 , American Artifacts and Richard Van Vleck, Taneytown, Maryland.